The domestic made AC311 light utility helicopter rolled off the assembly line and made a successful maiden flight in Tianjin on Nov. 8. The AC311 helicopter flew steadily, gracefully and nimbly at the first flight ceremony to fully demonstrate the performance of the domestic helicopter. The domestically-made AC311 is a 2-ton light utility helicopter capable of loading six people with a maximum carrying capacity of 2,200 kilograms. The AC311 helicopter can be widely used for various tasks, including flight training, personnel transport, public security patrols, communication and command, aerial photography, medical aid, power line inspection, forest fire protection and aerial pest control. It was reported that the AC311 helicopter was scheduled to be certificated by the China Civil Aviation in October 2011 and run into the market operation in 2012. The market demand is expected to reach 500 in the next 10 years. 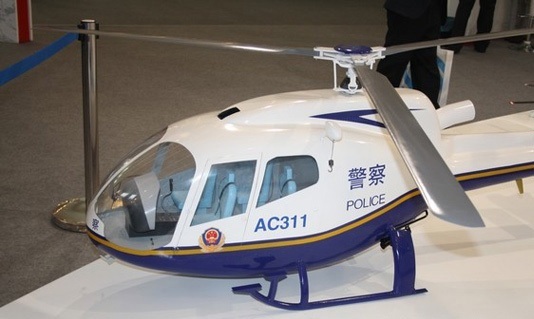 The AC311 light utility helicopter was independently researched and developed by the Aviation Industry Corporation of China.